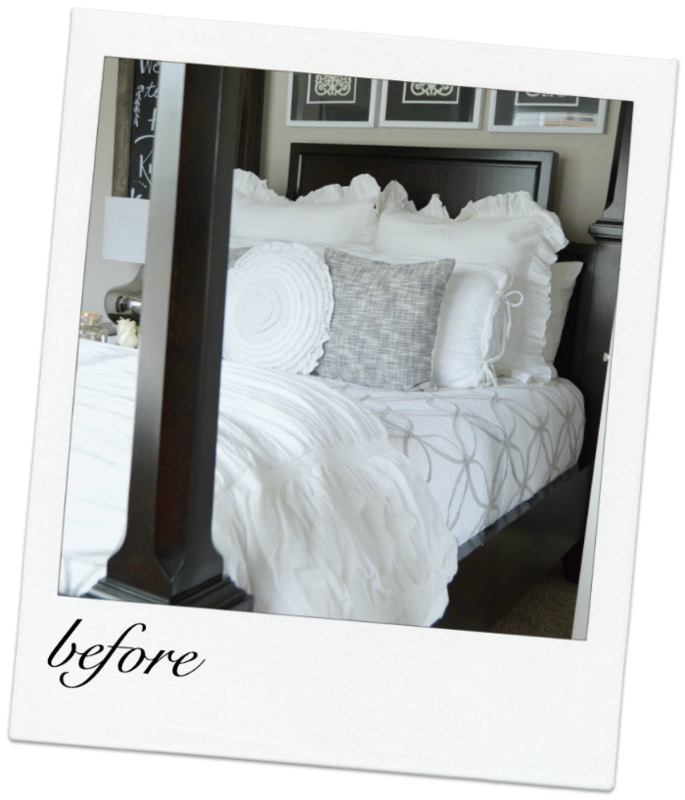 When we first moved into our home, we prioritized our master bedroom. 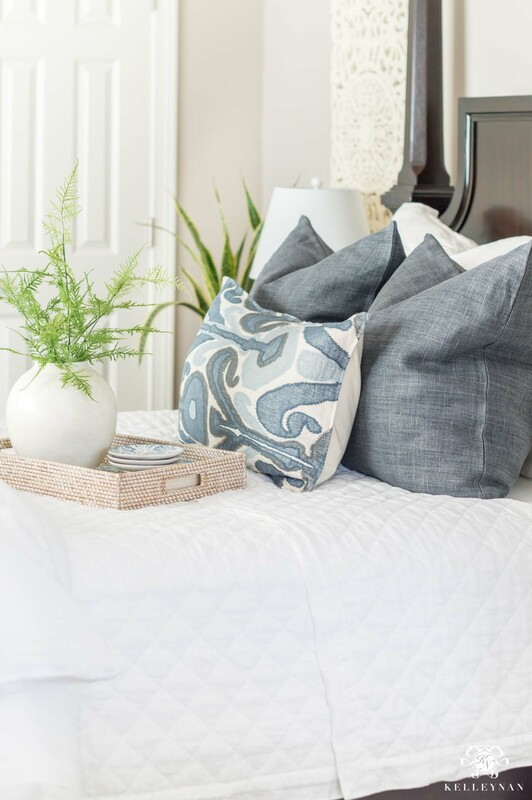 Two guest bedrooms started with semi-clean slates with intentional interim fixes, and the guest bedroom we “reserved” for Mama Nan was filled with all our previous master bedroom furnishings. 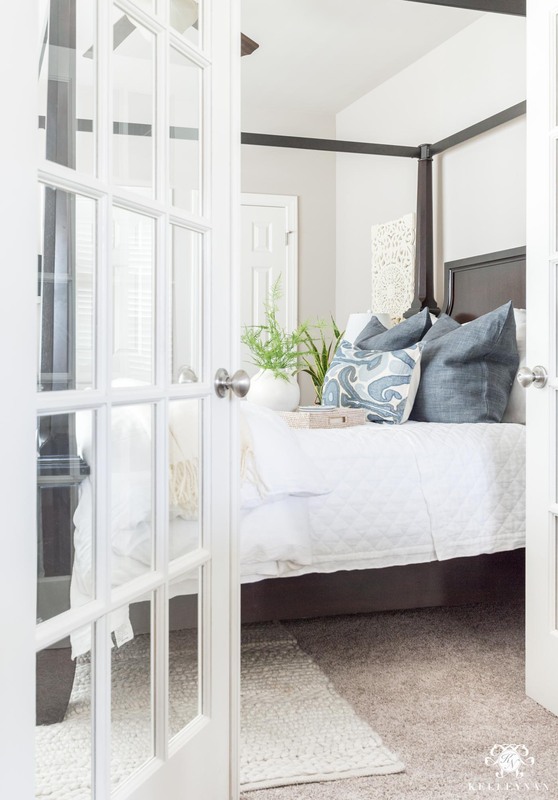 But, our former master bedroom was much larger than the french doored space most would have probably used as an office/playroom — the small, awkward layout definitely comes with its challenges and limitations. 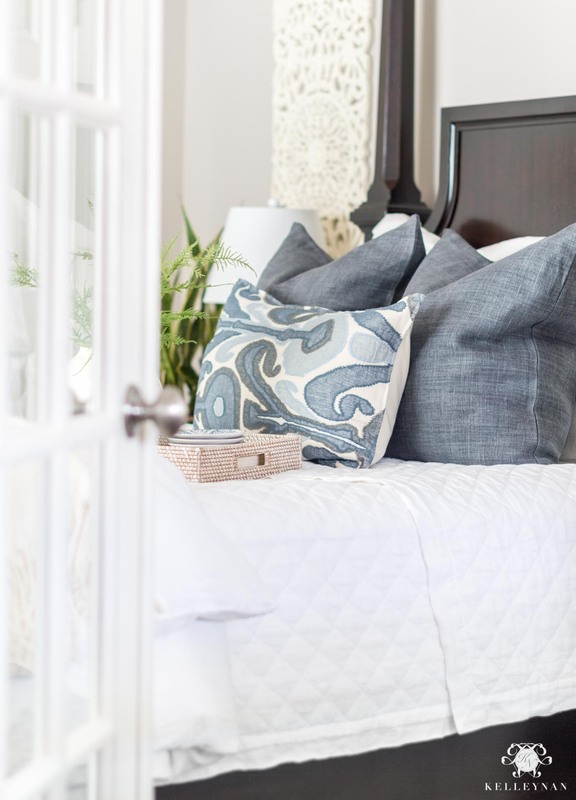 Over the past four years, we’ve tackled my office, master bedroom, blue and white guest bedroom, and the white guest bedroom which is now transitioning to a nursery, but Mama Nan’s room (the most frequented guest bedroom in the house) hasn’t been touched. Don’t get me wrong, it’s a sweet little guest bedroom but in terms of functionality, well, it doesn’t have much. After waiting and waiting for the “right time”, a Pottery Barn bed sale finally prompted me to get the ball rolling. 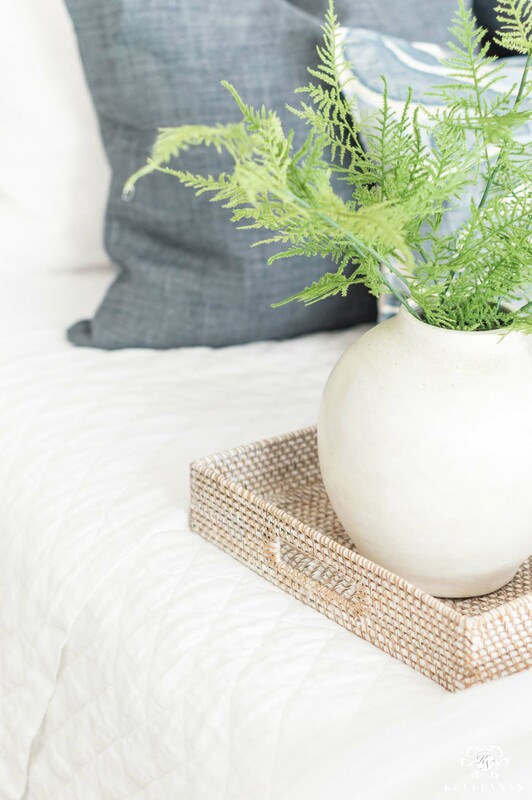 Mama Nan’s retreat is finally in the beginning stages of a makeover and today, I’m sharing the classic guest bedroom design plan. While I usually start big and work my way down to linens and accessories, I went a little backwards on this project, focusing on the priorities. We have so many balls in the air between other rooms that this will probably evolve and come together more gradually, like the living room (see the reveal HERE). I wanted to go ahead and get the bedding in so regardless of the stage of the room, Mama Nan would still be able to be visit and relax. Y’all know my love for THIS linen quilt and THIS linen duvet cover (see a full post on this “power couple” HERE) ; well, it seemed only fitting that my favorite person should have my favorite bedding ;). By the way, I’ve officially outfitted all my bedrooms in Pottery Barn bedding now. 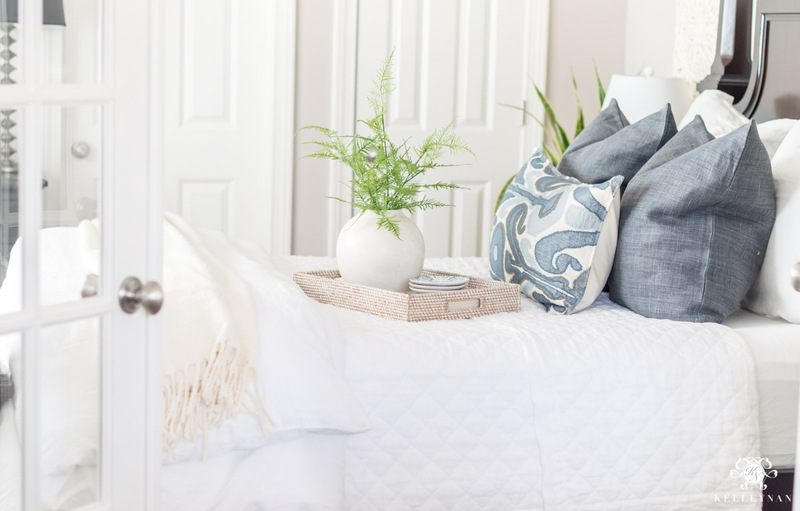 As my go-to and something I believe in investing in, I still have (and use) my oldest linen pieces that keep on lasting for years and years and only seem to get softer with each wash. Making a bedding switch and taking down some of the heavy, more cluttered wall decor alone made a huge difference. Here’s our new starting(ish) point. If you’ve been contemplating, it’s all on sale right now but 100%, if there were one piece I were to go for, it would be the Belgian Flax Linen Diamond Quilt HERE. 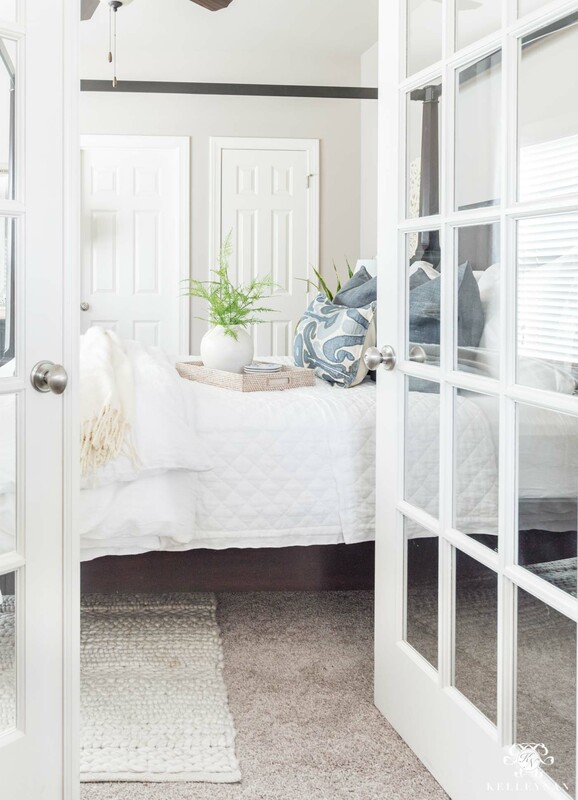 One of the challenges that quickly turned into one of my favorite room features was determining how to make the room private with one wall that’s a window and a perpendicular wall that is made up of glass, french doors. I installed curtain rods to span the length of the room as soon as we moved in, and hung privacy curtains. 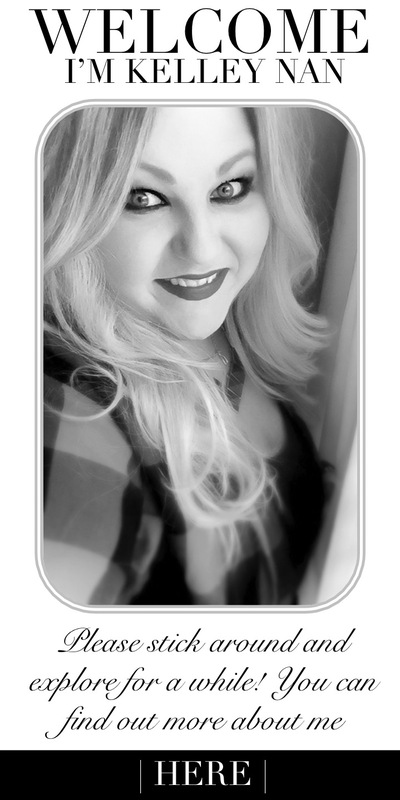 It works brilliantly but I don’t think I’ve ever shared because the curtains are cheap – and it shows haha. My plan is to install THESE linen curtains, in the double-width, blackout lining option, with THESE rings. 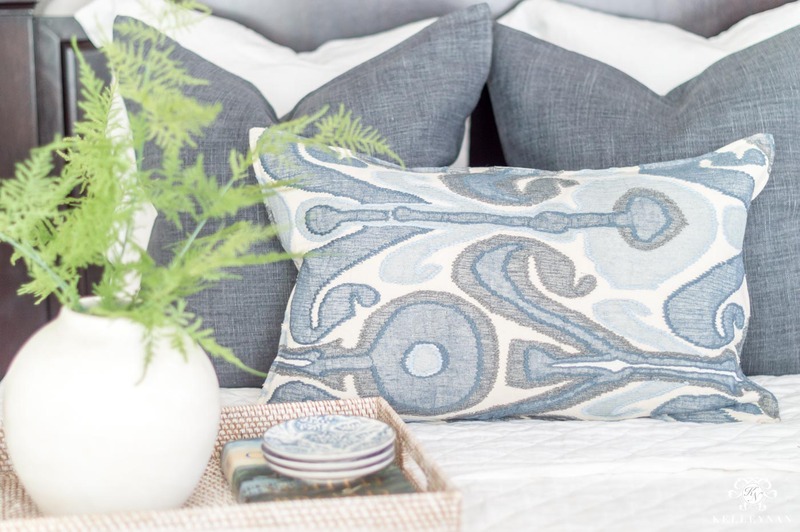 THESE bird prints totally steered the direction of the room and resulted in me springing for THESE 24″ Gunmetal Belgian Linen throw pillow covers, THIS large ikat embroidered pillow, stuffed with my favorite inserts that I always share HERE. And because this is literally the first time I think this room has ever seen any color, I thought it was dying for a little green to breathe some life into it. 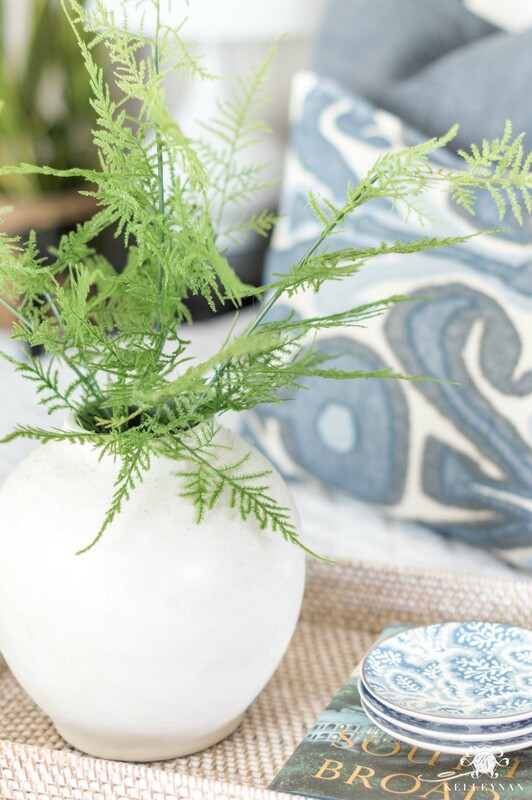 I arranged three of THESE dainty asparagus fern stems in THIS versatile ceramic vase and set a snake plant in the corner. We haven’t determined paint color just yet and the current dresser will likely remain. I’m planning to switch the light fixture (I think THIS lantern (on sale for $60 off) is reminiscent of a bird cage, which I love with the bird prints!) and will likely be bringing in a small fan, like we did in our bedroom 😉 THESE nightstands are smaller scale and should work well in holding all the essentials, along with a pair of THESE usb lamps (on sale for almost 1/2 price!). With crazy changes happening in our little family, my fingers are crossed that Mama Nan will be staying with us a little more frequently (*wink, wink*) and I’m stoked to get her bedroom in a place that will serve her well while she’s with us! Follow this project (and all the others!) as it unfolds by subscribing to my emails at the bottom of this post. Kelley, Mama Nan may not want to leave this beautiful room (untill baby arrives). We are trying to wait patiently along with you and Dave! I wanted to look at the lumbar pillows but the link will not open. Everything is just lovely and blends with your other rooms. The link is working now. Maybe it was my computer at work!! 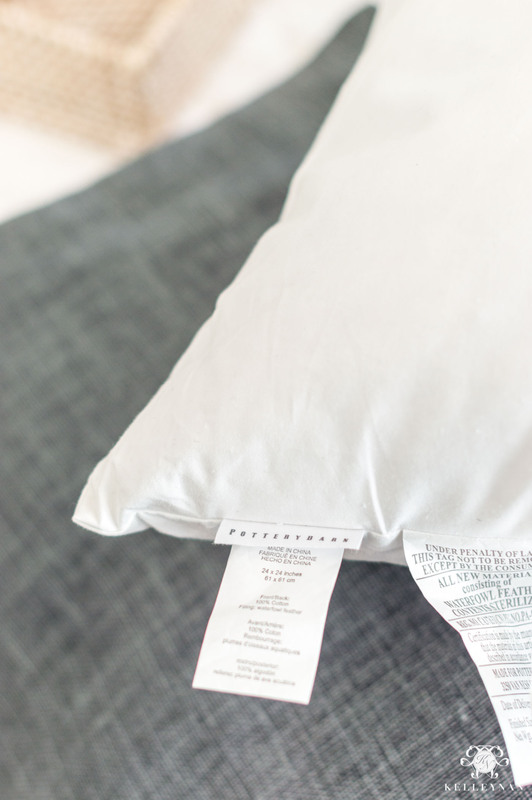 Lovely fabric on the pillows. Another home run on this room. Your guest will feel very pampered. I’m curious, do you have to sew those rings onto the curtains? 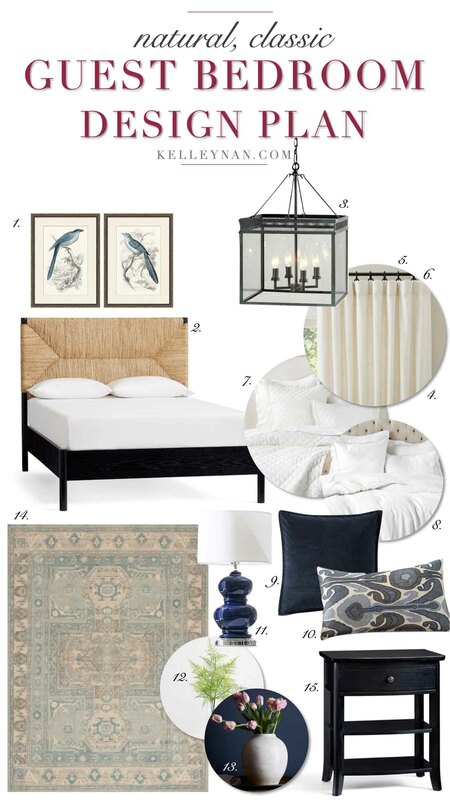 Where is the beige area rug from, in your new guest room? Your Mom will love it!!! So I think you are off to a great start. Am sitting here wondering if you could switch the hinges to make the French doors swing the other way to give a more spacious vibe?